This insistence upon the political character of war is the reason Anatol Rapoport identified Clausewitz’s philosophy as a political theory of war, which Rapoport contrasted to cataclysmic and eschatological theories of war (something that I have discussed in More on Clausewitz, Toward a Dialectical Conception of War, Species of War and Peace, and War and Peace, Again). A generalization of Weyl’s observation beyond the exclusive concern for creative activities of man might comprehend both creative and destructive activities of man, and that human activity, whatever form it takes, is conditioned by the decisions of history and therefore defies complete objective rationalization. Of course, I doubt even Clausewitz (Enlightenment philosopher of war that he was) would have thought that war transcended history and is amenable to complete objective rationalization, but we must of course think of this in comparative terms: we would have high expectations for mathematics to conform to this ideal, and relatively low expectations for warfare to conform to this ideal, but all human activities would presumably fall on a continuum defined at its end points by that which is entirely immanent to history and that which entirely transcends history. It is the degree of being “conditioned by the decisions of history” that marks the difference between abstract and a priori disciplines like mathematics and concrete and a posteriori disciplines like war. It would be interesting to construct a philosophy of war based upon the idea that war does in fact transcend the accidents of history and is amenable to complete objective rationalization, but I will not attempt to do that at the present moment (but I will suggest that we might call this, in contradistinction to the political, eschatological, and cataclysmic conceptions of war, the transcendental conception of war). In the meantime, I will assume that war eludes a transcendental theory and must be given a theoretical treatment (if at all) as being “conditioned by the decisions of history” to a greater or lesser extent. Moreover, I will make the same assumption about civilization, which appears to be as “conditioned by the decisions of history” as is the constant warfare that has attended civilized life. Civilization also eludes complete objective rationalization. In this, then, we already see that war and civilization belong to similar spheres of human endeavor, residing near the empirical end of the a priori/a posteriori continuum, while mathematics and logic lie at the opposite end of the same continuum. That is to say, we have similar theoretical expectations for war and for civilization. Thus, for Clausewitz, the highest degree of civilization coincides with the highest degree of military genius; high achievement in civilization is the necessary condition for high achievement in war. Military exploits can be the work of genius, like a sculpture of Michelangelo or a fugue by Bach. Brilliance, then, whether expressed in war or in any other endeavor of civilization, requires the achievements of high culture (presumably cultivated by civilization) to reach its ultimate expression. All of this has been stated — as Clausewitz stated it — giving civilization the priority, but all of these formulations can be inverted ceteris paribus, with war given priority, so that, for example, the highest degree of war coincides with the highest degree of civilizational genius; high achievement in war is the necessary condition for high achievement in civilization. Here we see again, as we have seen before, that war and civilization are convertible. The antithetical view is that war and civilization are not convertible, but antithetical. For Clark, industrialized society and industrialized warfare is transparently barbaric and antithetical to civilization. This is what many of us would like to believe, but in order to believe this we must adopt a systematic blindness of the history of civilization, since war is implicated at every step. In every age of organized human activity, civilization has built monuments to itself, and war has destroyed most of them. A few treasures remain for us from the past, but they are the exception, not the rule. The history of civilization without war is also the exception, not the rule. We flatter ourselves when we only condescend to give the name of civilization to a certain range of values that we believe reflect well on humanity. This reminds me of the scene in the film Dead Poets Society in which the professor ridicules the overly-refined and delicate way in which Shakespeare is often presented. In the film this is a laugh line, but in real life people really convince themselves civilization is the equivalent of the comedic presentation of Shakespeare. Even as we attempt to flatter ourselves by associating humanity with a certain selection of values, we also impoverish ourselves. We must convince ourselves, against experience and reason, that civilization is a delicate and fragile thing, rather than the robust reality that it is, forged in war, tried by fire, and built out of sacrifices. Marx’s oft-quoted passage captures the intersection of human agency and vulnerability to circumstances. Men make their history, but not simply as they please. That is to say, history is partly made, partly the result of human agency, and partly it is a thing that is not made, the result of no act or decision of any one individual or group of individuals. Again, unless one is a fatalist, this is difficult to accept. If, on the other hand, one is temperamentally fatalistic, one will embrace one’s contingent lack of agency in the world as an affirmation of one’s conception of history. This is the philosophical equivalent of confirmation bias, and it is a bias that we live by. There are many conceptions of history that men live by; one is not confined to choosing between a dialectical opposition between agency and fatalism, and even choosing a point on the continuum between the two. It occurred to me today that one way to divide attitudes to history can be derived from Anatol Rapoport’s introduction to Clausewitz, which I previously discussed in More on Clausewitz. Rapoport distinguished political, cataclysmic, and eschatological conceptions of war, but we need not limit these conceptions to war. 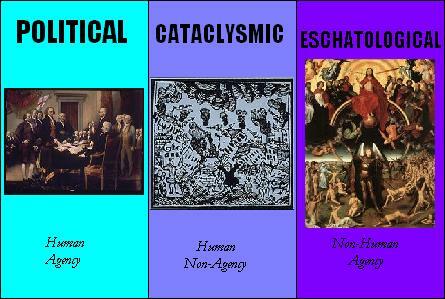 We can, broadly speaking, adopt political, cataclysmic, or eschatological conceptions of history on the whole. In other words, we can conceive of history as being subject to the agency of human beings (the political conception), as being subject to no agency whatsoever (the cataclysmic conception), or as being subject to a non-human agency (the eschatological conception). These, then, are three over-arching conceptions of history that an individual could adopt. I assume that an individual will usually adopt that of history conception that is most closely in accord with his or her temperament. As Fichte said, the kind of philosophy one has depends on the kind of man one is. This statement has been widely deprecated by subsequent philosophers, but I for one would defend it. Last May in Human Agency in History I suggested that grand strategy can be defined as integral history subordinated to human agency. In doing so, I revealed my bias as to history. But the very idea that there can be such a thing as grand strategy implies that human beings have at least some degree of agency in the world, however compromised and limited. However, we certainly could formulate conceptions of grand strategy based on alternative conceptions of history, to whit: political grand strategy, cataclysmic grand strategy, and eschatological grand strategy. Some of these ideas may seem like a stretch, but it is a salutary conceptual exercise to try to stretch the mind to accommodate unfamiliar thoughts. And, having only just now formulated the above division of grand strategies according to world view, I can think of an illustration of one of the more unlikely conceptions, that of eschatological grand strategy. And it is this: several historians have related that, under the Byzantine Empire, the belief in divine providence was so prevalent in the society, and hence in the troops mustered by the society, that soldiers on the battlefield would look for signs that one side was winning or losing, and when the decision of the battle seemed sufficiently clear, the losing troops would rapidly capitulate, assuming that it was the will of God that they should lose the battle. Here is a very practical application of a eschatological conception of history and its application to grand strategy. I could easily produce a naturalistic account of such actions, but such an account — while perhaps preferable, indeed perhaps even true — would not do justice to how the participants in the events understood them. A naturalistic account of eschatological grand strategy, in other words, would not penetrate into what Collingwood called the “interior” of events. 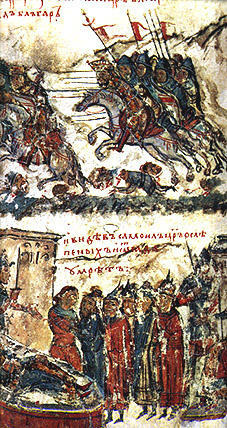 Byzantine soldiers were reputed to throw down their arms and flee the battle field when the tide of events turned against them, convinced they had seen the hand of God at work. A little more thought might furnish further interesting (and unfamiliar) examples of Weltanschauungen and the grand strategies that follow from them. This post has been superseded by subsequent posts in which I expand the framework here from three conceptions of history to four conceptions of history. See, for example, The Naturalistic Conception of History, Revolution and Human Agency, and Cosmic War: An Eschatological Conception. Contradictory concepts are locked in a dialectical relation. Logically, this means that a definition of a given concept yields the definition of its contradictory through negation. If war is the contradictory of peace, and peace the contradictory of war, then a negation of a definition of war yields a definition of peace, and a negation of a definition of peace yields a definition of war. Things are rarely as simple as this in fact; this kind of conceptual neatness is rare. Concepts — especially old concepts with a long history — tend to be complex and to be related by implication to many other concepts. Conceptual pairs like war and peace — sometimes called polar concepts — are assumed to be contradictories when they are in fact richer in content and the polar concepts imply more than each other. And what concepts could be older than those of war and peace? The emergence of civilization is nearly identical with the emergence of war in human history, and the idea of peace emerges as a hope immediately following upon the depredations of war. Thus war and peace are not precisely dialectical, not precisely definable in terms of the contradictory of the other. This in itself renders war and peace as dialectical concepts, as any attempt to think them through coherently and systematically engages the thinker in an attempt to reconciling internal tensions within the concept. If successful, this process yields a higher synthesis that transcends the limited perspective and scope of previous definitions of the concept and establishes a more comprehensive concept informed by previous conceptions but more adequate than earlier formulations. Conceptual pairs, like war and peace, that are apparently or superficially contradictory yet integral in fact are common in our intellectual experience. A few weeks ago I mentioned Romero’s distinction between doctrinaire and inorganic democracy. This is a great example of what I am trying to illustrate. What we have are two clusters of concepts that suggest in turn two further contradictory clusters. Doctrinaire democracy is contradicted by non-doctrinaire democracy (each can be defined as the negation of the other), while inorganic democracy is contradicted by organic democracy (which, again, can each be defined as the negation of the other). Thus doctrinaire and inorganic democracy stand in a problematic relationship to each other, as do non-doctrinaire and organic democracy. But systematically setting these concepts within a theoretical context that includes them all may help to illuminate the initial pair of concepts with which we began. Thus the pair of concepts, globalism and anti-globalism, extends the concept of globalism simpliciter, so that the only obvious permutation missing in this twice extended concept of globalism is that of anti-tribalism, and it is here, finally, that we recover the nation-state. For the nation-state is an undeclared anti-tribalism: personal loyalty to chieftain must be abolished so that a territorial loyalty to the nation-state can take its place. “How could anything originate out of its opposite? For example, truth out of error? Or the will to truth out of the will to deception? Or selfless action out of self-interest? Or the pure sunlike gaze of the sage out of covetousness? Such origins are impossible; whoever dreams of them is a fool, even worse; the things of the highest value must have another, separate origin of their own—they cannot be derived from this transitory, seductive, deceptive, lowly world, from this turmoil of delusion and desire! Rather from the lap of being, the intransitory, the hidden god, the ‘thing-in-itself ’—there must be their basis, and nowhere else!”— This way of judging constitutes the typical prejudice by which the metaphysicians of all ages can be recognized; this kind of valuation looms in the background of all their logical procedures; it is on account of this “belief” that they trouble themselves about “knowledge,” about something that is finally christened solemnly as “the truth.” The fundamental belief of the metaphysicians is the belief in antithetical of values. What could be more true of the opposites of war and peace? The faith in antithetical values has encouraged us to believe that war and peace are precisely contradictory, but we have seen that the concepts are more complex than that. We can easily see how the concept of peace might emerge from the concept of war, or vice versa, from Clausewitz’s famous definition of war as the pursuit of politics by other means. Clausewitz restates this principle throughout On War and gives it several formulations, so that it constitutes a point of reference for his thought and is the locus classicus for what Anatol Rapoport called political war (in contradistinction to eschatological war and catastrophic war). This Clausewitzian principle inevitably invited the formulation of its inversion by Foucault: “politics is the continuation of war by other means.” (“Society Must be Defended”: Lectures at the College de France 1975-1976, p. 15) Thus politics, ideally peaceful, can be transformed into war, and war can be transformed into peace. In holding that war is the pursuit of politics by other means, Clausewitz implicitly invokes the ends/means distinction, and suggests that the end, aim, and goal of war and politics alike is the same; only the means are different. War is the use of military means — violence — to compel another to do our will, whereas politics employs diplomatic means in the attempt to compel another to do our will. Seen in this context of means and ends, the transformation of war into peace and peace into war becomes obvious. Politicians pursue their ends with diplomacy, and finding the result unsatisfying turn to force in the attempt to attain the same ends. The use of force either attains these ends satisfactorily, in which case the war ends, or the ends are not attained, and eventually the war ends because it is seen as ineffectual in attaining the desired ends, and the politicians return to diplomacy in the attempt to secure that which could be be gotten by force. Recent history has been rich in indecisive conflicts — the Colombian civil war, the Lebanese civil war, and the recently settled Sri Lankan civil war — in which the combatants have gone between peace table and battlefield as though through a revolving door. In such contexts, “peace” means little, and the temporary absence of armed conflict is only called peace for lack of a better term. In so far as peace is an ideal — and we are well familiar with this ideal from literature and art — and not merely the cessation of hostility or the temporary absence of armed conflict, the greater part of the world for the greater part of history have not known peace. It was a tradition among the Romans that the doors to the Temple of Janus — called the Gates of War — would be closed in time of peace. This is said to have happened only five times in the combined history of the Republic and the Empire. As a day of remembrance that often highlights the sacrifices of the military, there is a sense in which it is eminently appropriate to write about Clausewitz today. In yesterday’s Another Book that Changed the World I discussed Hew Strachan’s Clausewitz’s On War: A Biography. Today I should like to further pursue some Clausewitzian themes. In Anatol Rapoport’s Introduction to the widely available Penguin abridgment of On War, Rapoport distinguishes three philosophies of war which he calls the political, the eschatological, and the cataclysmic. I would rather call these three conceptions of war — conceptions that can be illuminated by philosophical analysis — but I won’t quibble over this at present. Rapoport gives Clausewitz as the paradigmatic representative of political war, characterizes eschatological war as a messianic conception with both sacred and secular variants, and describes the cataclysmic conception of war as something akin to a natural disaster like a fire or an epidemic. The comparison of war to the inevitability of a thunder-storm classes Sherman amongst the cataclysmic philosophers of war. In Rapoport’s exposition of these three philosophies of war, war appears as an event that “happens,” interrupting the “ordinary” and “normal” condition of peace that prevails, or ought to prevail, and it is clearly implied that something must be done to “explain” the outbreak of war. Why not rather explain the outbreak of “peace”? In what sense can we consider peace to be a norm that is shattered by the outbreak of war? In fact, it is not. War is no less the norm than peace. Such assumptions are foreign to Clausewitz’s theoretical framework. The famous aphorism that is associated with Clausewitz, “War is not merely a political act, but also a real political instrument, a continuation of political commerce, a carrying out of the same by other means” (Book I, Chapter I, 24) proposes a continuity between state policy and war, and this is as much as to propose a continuity of war and peace. There is not only a continuity of the genesis of war of peace, but a continuum that bridges the apparent gap between war and peace, and the actions and policies of most nation-states can be located somewhere along this continuum while only rarely would it be accurate to say that they unambiguously should be classed at one extreme pole or the other of a smoothly graduated continuum. Clausewitz was wrong about war being crueler among savages; anthropological research since his time has shown definitively that war is far more costly in lives and materiel among so-called “civilized” peoples, but the important idea here for Clausewitz is that war is subject to, and shaped by, social conditions (something that I discussed in Civilization and War as Social Technologies). As I noted yesterday, for Clausewitz, war is a form of social organization, a form of social technology, that is integral with other forms of social technology (these are my terms, not Clausewitz’s terms). War is an extension of social custom to violence, but, as Clausewitz and Sherman note, the violence cannot ultimately be limited. To limit the scope of violence in war is to leave open the possibility to another party to the conflict not observing these limits and thus triumphing by default. We see clearly in the integral nature of war and peace within a political continuum Clausewitz’s dialectical conception of war. The Clausewitzian dialectic is equally present in the interrelation of violence and social custom.